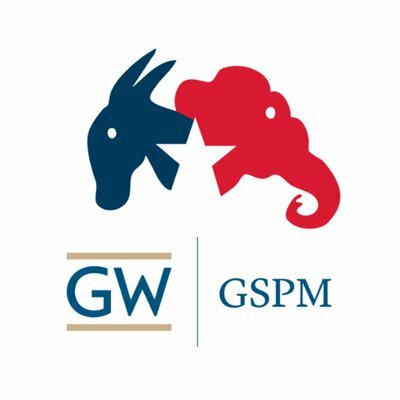 Since its inception, George Washington University's Master's Degree in Political Management has been the leader in defining and shaping the political and communications professionals who, in turn, shape society. Students regularly connect with leaders in advocacy, communications, and politics inside and outside of the classroom. The GSPM alumni network permeates the upper echelons of elected politics, public affairs, NGOs, issue advocates, and trade associations around the world. Studying at the Graduate School of Political Management will broaden your mind and enhance your vision to help you successfully confront society’s most pressing challenges. The school is uniquely positioned in the heart of Washington, D.C., which allows it to attract a faculty comprised of prominent scholars as well as political practitioners at the highest levels of campaigns, advocacy, government, public affairs, and more. The curriculum allows students to build a portfolio of work, as well as guiding principles, that will shape their careers for years to come. They are confident in this approach because more than 4,000 alumni around the world are some of the rising stars and most respected names in politics. Those who wish to earn a master’s degree in Political Management would only need to complete 24 additional credit hours (8 courses), and they would be waived from two of the introductory requirements (PMGT 6402 and 6404). They would then be expected to complete the other three required courses (PMGT 6401, 6403, and 6495), along with five of the electives offered in the program. Interested students will be required to follow George Washington University’s Admissions process and must obtain a minimum 3.3 overall GPA on a 4.0 scale in addition to obtaining at least a B in each of their classes, in order to have their graduate certificate courses considered for transfer credit in one of these two GW master’s degree programs. Students must also obtain a letter of recommendation from the Program Coordinator to be eligible to pursue this pathway.